There’s this guy I recently read about. As a child, his dad had a thriving business and he considered their family to be rich. Then suddenly his dad’s business burned to the ground, and his family scrambled and scratched out a living, fighting for several years to keep a roof over their heads. As an adult, this guy studied hundreds of people, rich and poor, to determine if there were characteristics that we could be teaching our children to avoid poverty. I read his thought-provoking article today, entitled, Will Your Children be Rich or Poor? Author: Thomas Corley. In his research he found that there were some marked differences in habits between the rich and the poor. (And some surprised me!) From this he suggests lessons we should be teaching our children to help them be financially successful. There’s not room to write about all of the habits Thomas Corley identified and the lessons he derived from them, but here is my take on several of his ideas about whether your kids will be rich or poor, based on the lessons taught them. What first caught my eye in the article was that he validly asserted that too often American kids are hearing from the media that having money is bad. And that because some people are wealthy, they must be corrupt. And that maybe this wealth should be redistributed to those in need. I don’t know about you, but that’s a scary thought that reeks of socialism. Mr. Corley says we need to stop teaching our kids that money, in itself, is bad. I agree with him. It is not bad in itself; it doesn’t make anyone happy or fulfilled; it is merely a means of exchange. 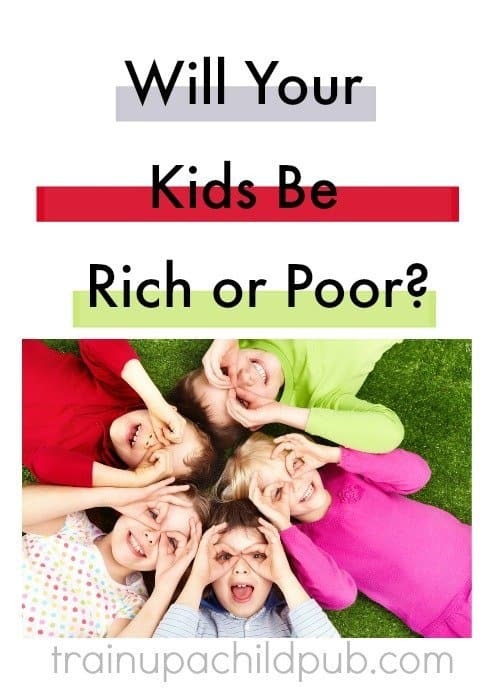 Will your kids be rich or poor? It might largely depend on the lessons you teach. Lesson One: Teach your kids the value of and how to handle their money. As homeschoolers, we have the PERFECT opportunity to teach our children how much work goes into making money. There is nothing like an hour or two of backyard weeding in the summer heat for $5 to help your child to see that making money is hard work! A friend of my son’s always had plenty of money given to him. He had the latest and greatest of….whatever…and he could go out to eat, go to the movies, and generally could afford whatever he wanted. In contrast, and often to his frustration, our son had to save gift money from Grandma and earn his own money for things he wanted to have and to do. Then when our son was in high school I found some used Dave Ramsey curriculum and called the resulting course “Consumer Math.” (There’s another alternative that would work on sale in this bundle of products.) I can’t tell you how much that course shaped our son’s spending and saving habits! It was like a light switch was turned on for him! While learning about handling money successfully is a no-brainer for future financial success, here’s a fascinating tidbit Mr. Corley also found: almost 80% of the rich spent five hours or more a month on networking activities, while only about 16% of the poor did so. Lesson Two: Teach your kids how to relate to and communicate with others. Start developing these basic social skills early by teaching your preschool children how to have respect for others by looking at them in the eye and saying hello when they are introduced. Do your children write thank you notes for gifts at Christmas-time and birthdays? Or if someone just does something nice for them? If they don’t, it’s never too late to start. Emails are just not the same as a note in the mail. Another point that Mr. Corley stressed was that the rich managed their time well, spending less time on TV and recreational electronics (like watching cat videos) and more time talking to one another, face to face. Like an hour a day. Lesson Three: Teach your children to manage their time rather than letting it manage them. One of my favorite statistics (you’ll love this, too), according to Mr. Corley, was that “63% of self-made millionaires were required by their parents to read two or more non-fiction books every month, while only 3% of poor parents” required their children to do this. He suggests that the lesson from this statistic is to have children read at least one non-fiction book a week and write a one page summary of each one. Lesson Four: Work into school plenty of opportunities for your children to read biographies and other non-fiction books. I am a big fan of this! Our literature–based studies are full of books of this nature, and I’ve seen how transformative they can be! If you don’t use a literature-based homeschool curriculum, you can still incorporate excellent literature into your homeschooling. Reading biographies of heroic characters will inspire your children because of the courage, integrity, resourcefulness, etc., of those who have gone before us. Developing the habit of reading non-fiction books will help your children become life-long learners. Let your kids see YOU do that, too – when you want to learn about something, pick up a book! In conclusion, I’m certainly not saying our primary goal is to teach our kids how to be rich. But we do want to promote healthy habits in our kids to help them become mature, responsible, successful adults. Rich or not, managing one’s money wisely, becoming adept at dealing with people, understanding how to manage one’s time, and becoming life-long learners are vital life skills that will benefit our kids throughout their lives. Read the article in its entirety here, then stop back by and tell me what statistic surprised you the most!